Kestrel offers a line environmental monitors from a simple wind-meter (the 1000) up to the 4000 NV model. Much of tactical shooting is focussed on engaging targets at close range, with pistol, rifle, and shotgun. At these short distances, the shooter can ignore the atmosphere; the wind isn't going to blow his 9mm bullet off-target before it impacts the 10-yard target, nor will it deflect his 5.56mm bullet before it impacts a 50-yard target. In these scenarios wind, temperature, and altitude or pressure changes will not affect his ability to deliver hits on target. For the precision long-range shooter employing a bolt-action sniper rifle, however, monitoring the wind and environment is critical to making hits. Both law-enforcement and military employment of precision rifles is such that first-round hits are paramount; shooting multipe rounds is often unacceptable because the target will be alerted to the shooter's presence and react. 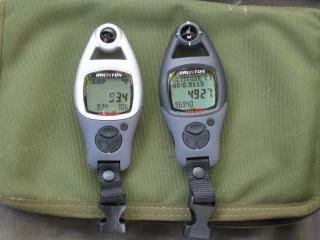 The Extech and Speedtech units are similar, but the Speedtech SM-28 offers more measurements of interest to the shooter. The environment changes the bullet's path in basically two ways. The first is wind. Wind is ever-present, with totally calm conditions being rare. Wind primarily affects the bullet's path by pushing it left or right. Winds pushing the bullet up or down are rare, unless there are intervening terrain features such that a strong cross-wind is deflected up. A light wind of five miles per hour (mph) going straight left to right will deflect the path of a .308 by about three inches at 300 yards. This shooter uses his Brunton to get baseline environmental readings during a rifle match at the NRA Whittington Center in Raton NM. muzzle, gravity tugs it downward, which makes it drop more the further it travels. Since a bullet in a thicker atmosphere will take longer to get to 500 yards than the same bullet fired in a thin atmosphere, the one fired in the thin atmosphere will have less drop than the one in the thick atmosphere. The ultimate effect of atmospheric density for the shooter is that his drop tables will change based on the density of the air. 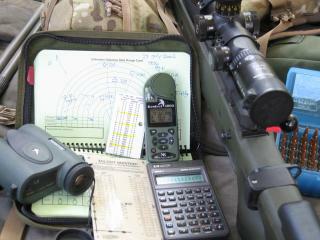 Making hits at long range requires accurate range estimation, ballistic data, and environmental monitoring. In summary, if station pressure goes down, altitude goes up, temperature goes up, or humidity goes up, then the air gets less dense and provides less resistance to the bullet. On the other hand, if pressure goes up, altitude goes down, temperature goes down, or humidity goes down, then the air gets more dense and provides more resistance to the bullet. What does all this mean in practical terms? The precision long-range rifle shooter needs to accurately estimate wind and keep track of environmental conditions in order to make first-round hits. Thankfully, there are some technological tools available which ease this task. The most basic tool is the hand-held wind-meter (or anemometer) which can measure the wind speed at the shooter's position. Environmental conditions are often described in terms of pressure, temperature, and humidity. Pressure is reported both as "station pressure", which is the actual barometer reading, or as a corrected number normalized to sea level based on the actual location altitude. With these three numbers, the shooter can cross-reference similar conditions in his log book, or he can use the parameters as input to a ballistic program to generate the drop values for his load. Keeping track of three independent parameters can be confusing. For a log-book, the shooter can end up with a lot of different environmental conditions, which are hard to match. If he runs data from one of the ballistic programs, he will have to sweep three variables to generate data for all likely conditions. There is also an overlap in pressure and temperature mapping to air density. For example, a cold 20-degree day in Denver will have about the same air density as a hot 95-degree day in Dallas. One solution to this is a figure called "density altitude." Density altitude is one number that represents the density of the air, which is all the bullet cares about anyway, and it effectively replaces the need for the three original parameters. The best way to utilize density altitude is to get the current value off one of the wind-meters that reports it, and use that as an index into the data-book or input into the ballistic program. With less technology, the shooter can cross-reference the location altitude with temperature to get a pretty accurate estimate of the density altitude. The benefit of the wind-meter is that it provides the shooter an accurate measure of wind velocity, however, the big limitation is that it only provides information about the current position. Wind is often different from one location to the next, and the bullet may pass through several different wind conditions along its path. If the wind at the shooter is 3 mph left to right, but it switches to 10 mph right to left 100 yards downrange, a left hold calculated at the shooter's position will result in a miss. The La Crosse Anemometer was the most compact of the bunch, but nonetheless very easy to use. 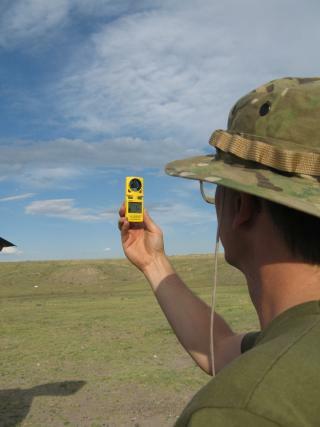 Even with this limitation, the hand-held wind-meter can provide a baseline wind condition on which the shooter can base his down-range corrections. Also, after playing around getting wind readings in different conditions, the shooter will eventually learn what wind indicators such as tactile feel, grass and leaf deflection, and mirage correspond to in terms of wind speed (mph). By correlating what 5 mph "feels like", he is better prepared to accruately guess wind conditions in the future. As the shooter arrives at his position, he pulls gear out of his drag bag such as his data book, range-finder, shooting support, and in some cases additional concealment materal. As he builds his range card, it is a good time to whip out the wind-meter to take a baseline reading of direction and wind speed, and annotate it on the card. As he waits and observes, he needs to keep track of local wind changes, and make judgements about wind conditions down range. At the Pawnee National Grasslands, where it is easy to find 1000-yard distances and strong winds, this shooter tries to get a handle on the current conditions. But wind is just one part of the total environment. For long-range shooting, keeping track of the altitude, temperature, and station pressure - the parameters which affect long-range trajectory the most - can mean the difference between a hit and a miss. 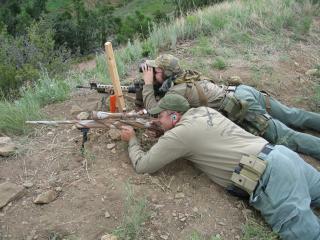 For shooters who travel often, changes in altitude are critical. At zero feet above sea level, a typical .308 load drops 213 inches at 800 yards, but at 5000 feet altitude, it only drops 194 inches-- a difference of almost two and a half minutes of angle. The Brunton units display a lot of information and are handy, but lack impeller protection. 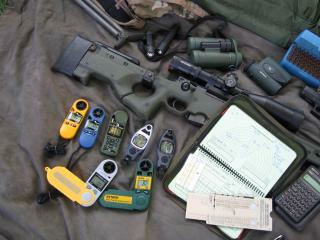 Stepping up from the basic wind-meter, there are several portable environmental stations available to the long-range shooter. Some such as the Speedtech Skymaster offer temperature or altitude, while top-end models like the Kestrel 4000 measure and report just about every atmospheric parameter one could wish for. I got my hands on nine different devices for evaluation. 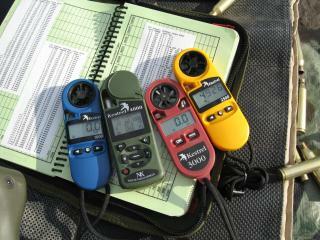 La Crosse instruments has a very simple and inexpensive Hand-held Anemometer for about fifty dollars. It is the most compact of the units tested, and the cheapest. It can be used to effectively monitor both the wind speed, and the temperature, and is pretty easy to operate. Extech's Mini-Anemometer measures wind speed, temperature, and relative humidity. Its physical size is amongst the largest of the reviewed units. 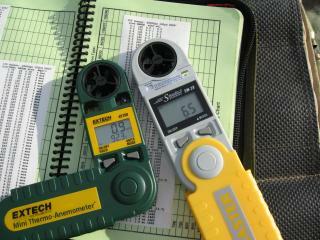 Speedtech's Skymaster looks and operates very like the Extech, but it can also measure station pressure and altitude. Both of these units have fold-out protective cases, which cover both the impeller, sensors, and controls. Their downside is that the controls are less user friendly than some of the other units tested. The portable environmental station goes right along with the other accouterments of the long-range shooter: an accurate rifle, binoculars, range-finder, Mil-Dot Master, log-book, ballistic charts, and a calculator. Next in line was Brunton, with their ADC "Wind", and ADC "Pro". The "Wind" model displays wind speed and temperature. The Pro model measures everything of interest: wind speed, temperature, relative humidity, pressure, altitude, and density altitude. The Brunton units are easy to use and compact in size. Unfortunately, their impeller is not protected by an external cover and might be more prone to damage than some of the other wind-meters. The LCD display scrolls through the different measurements, but most screens have three or four parameters displayed. This method of display can be a little confusing if you are looking for one number in a hurry. 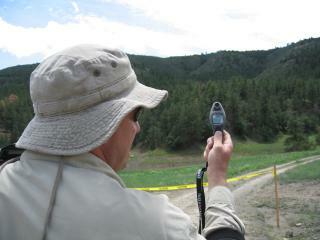 Hand-held environmental stations can provide the long-range shooter with information key to making the shot. Kestrel offers the widest array of hand-held wind-meters and portable environmental stations appropriate for field shooting. Starting out, the Kestrel model 1000 measures only wind speed. The next model up that I tested was the 2500, which displays wind speed, temperature, station pressure and altitude. The model 3000 additionally displays relative humidity, but not station pressure or altitude. Finally, the model 4000 is the most full-featured environmental station for shooting that I tested. 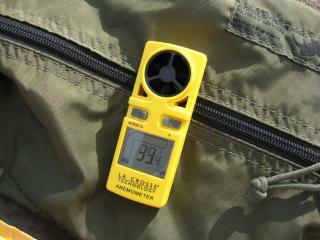 It measures not just wind speed, temperature, relative humidity, pressure, and altitude, but density altitude as well. The 1000 - 3000 models all have a slip-off plastic cover to protect the face of the device, while the 4000 has a flip-off impeller cover; the controls and LCD are not protected. The Kestrel units had the most straightforward operation and easiest to read displays of all the tested devices. The 4000 is available with a night-vision-compatible back-light in the 4000 NV. Which is right for you? If you want full wind, temperature, altitude and density altitude, there are only two choices: the Brunton ADC Pro and the Kestrel 4000. Of those, I prefer the 4000 because it is easier to read and has more features. If its price is too steep, the ADC Pro does the job. If all you need is a wind and temperature measurement device, the La Crosse Hand-Held Anemometer cannot be beat for the price. Note: Some atmospheric measures which are not relevant to long-range trajectory were omitted from the table, such as heat index and wind chill.